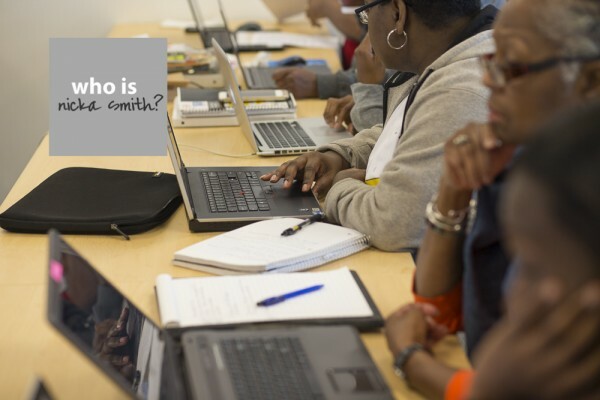 #BlackProGen at MAAGI in St. Louis - who is nicka smith? For the third year in a row, the Midwest African American Genealogy Institute continues break new ground in African American family history research. If you’ve never heard of the Midwest African American Genealogy Institute (MAAGI), let this serve as notice that you are missing a HUGE opportunity if you don’t attend after reading this blog post. If you have heard of MAAGI and you didn’t go…boy oh boy…please don’t miss out next time! The purpose [of MAAGI] is to educate and train those persons who have an interest in studying and documenting the history of African American families. Persons of all background are welcome to participate. The goal is to highlight those research techniques and strategies that are unique to family history of Americans of African Ancestry. This is first institute of its kind hosted by an historically Black institution. Harris-Stowe State University hosted the inaugural event in 2013, [the follow up event in 2014] and endorses it enthusiastically for 2015. 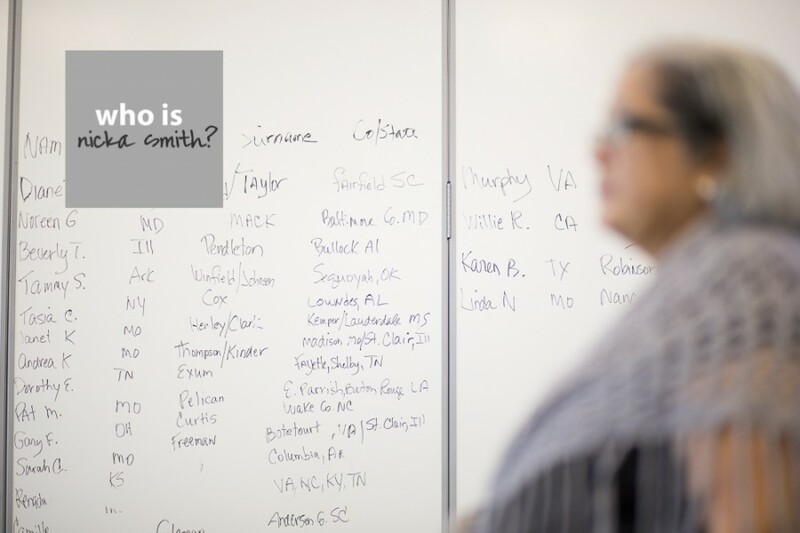 I am honored to have been part of the faculty at the institute since its inception and am in good company; my geneabuds Judy Russell, Thomas MacEntee, Angela Walton-Raji, Bernice Bennett, Shelley Murphy, Janis Minor Forte, Melvin Collier, and more have also served as faculty. MAAGI is THE place to be on a yearly basis when it comes to African American genealogy research. Why? For me, the number one reason is because it’s not a traditional conference. Usually, a speaker will get up in front of a group, say their piece, answer questions and that’s it. MAAGI exists to take the traditional genealogy conference further by emphasizing workshops versus lectures. Attendees immediately implement what they are learning by applying it to their own genealogy while the conference is actually taking place. 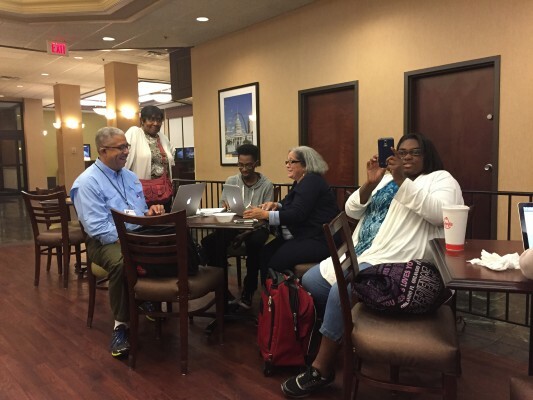 Attendees gather in the hotel lobby to work on brick walls and strategies during MAAGI 2015 in St. Louis, MO. When you take into account that African ancestored genealogy is hardly ever featured at most notable genealogy conferences, MAAGI further sets itself apart by focusing on African ancestored genealogy. Add to that the fact that attendees take a series of classes or tracks to even further focus their learnings and bam…you’ve got magic! The magic is so palpable that attendees are heading to bed late nearly every night after staying in the hotel lobby to help their fellow classmates with brick walls, questions, or strategies. MAAGI is definitely one of a kind. This year, I presented “Publishing Your Family History: The Good, The Bad, and The Ugly.” In this presentation, I focused on the process that I use to develop the Atlas Family History book, which is now in it’s seventh edition. I also got a chance to FINALLY meet Melvin in person after nearly a decade of knowing each other. It was way overdue. Below are some of the images I photographed during the conference. I had a ball and can’t wait until next year! An awesome recap of #MAAG2015. It was truly an awesome experience and you captured it well. I love your recap of MAAGI. You took some excellent photos and you summed up the institute perfectly. Great job, Nikka! I hope to make it back, next year!